Your goal is to ensure that all ship systems are functioning properly before time runs out. Each player must deal with the various malfunctions in their sector by flipping cards from the malfunction deck in front of them, and fixing the ship’s systems. 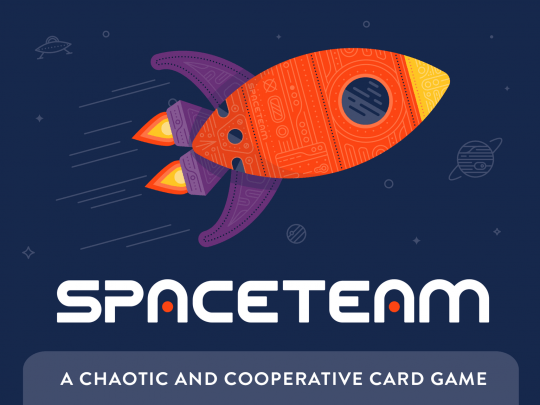 You’ll have an arsenal of disorganized space tools spread among all players’ hands, but finding the right tools can be harder than you think, especially when your Spaceteam is franticly worrying about malfunctions in their own sector. If that wasn’t hard enough, you’ll also have to deal with complications such as wormholes and asteroid fields, which require the coordination of the entire Spaceteam. There are no turns; everyone plays and shouts at the same time. Victory is achieved if enough malfunctions are corrected to reveal the 6 hidden System-Go Cards before time is up.